For families and couples looking for a countryside retreat replete with lush green forests and old towns, Les Portes d'Alsace is an ideal choice. Located nearby to the National Hunting Reserve Petite-Pierre, this luxury camping site is the perfect location for exploring Alsace's historic towns, natural landscapes and gastronomy. With several national parks and many cultural highlights to visit, Les Portes d'Alsace is an ideal escape to the country. Located in Saverne at the foot of the Vosges Mountains and the castle of Hohbarr, Les Portes d'Alsace offers a gateway to the Alsace region's many touristic treats, just 40 km from the historic city of Strasbourg. With forested mobile home areas, Les Portes d'Alsace offers a relaxing base with plenty to do and see. You can also relax with the variegated services onsite. With a swimming pool and activities for children, book a relaxing camping holiday at Les Portes d'Alsace with LuxCamp. Why choose Camping Les Portes d'Alsace? Summertime kids clubs for ages 4 to 10, Monday to Friday. Library to borrow books and magazines to study by the pool. Many hikes in the Alsace area, with bicycle rental and horse trails. Playgrounds for children with table tennis. There is a heated swimming pool area with designated swimming, whirlpool, paddling pool and aqua gym events. Your kids won't want to leave the covered poolside area no matter the weather. With loungers for sunbathing, the covers can be opened for the summer sun. With bread and pastry freshly baked every morning, you can collect your breakfast from reception. An on-site mini-market provides daily essentials, with drinks, ice-creams and meals to take away. 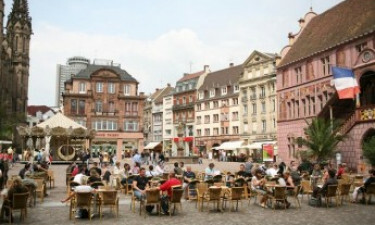 There is a short 15-minute walk to Saverne and local restaurants.